Rick Steves said that the best ice cream in Italy is in Florence so when Yi and I were there, we made sure to eat several gelati a day. At first, we sought out the gelati places recommended by Rick but after two days, we just bought any gelati we saw because our conclusion was that gelati is not necessarily the best in Florence but all gelati is good anywhere in Florence. Quite a sweeping statement, but in 4 days we ate gelati from at least 8 shops. Our No.1 choice for gelati is still the one in Rome. Wait for the drumroll when I get to my Rome posts. The gelati from that gelateria would be my one of the items on my death bed food list. I wonder if they ship. 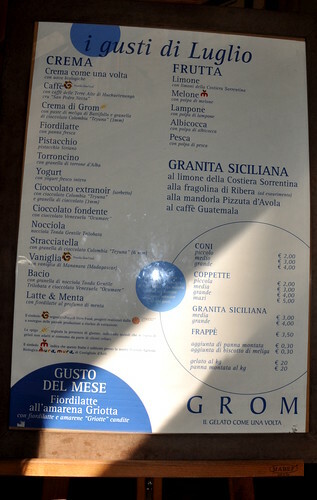 Grom (near the Duomo) is one of the gelateria highly recommended by Rick. No place to sit in the crowded shop so people ate their gelati outside the shop, standing or sitting on the pavement. We sat. My dear friends Y n PL would never do that. According to Rick, 'home made' gelati is always in covered metal canisters but I found it's not necessarily so. Lots of superb gelati are not covered. A medium cone is 3 euros. 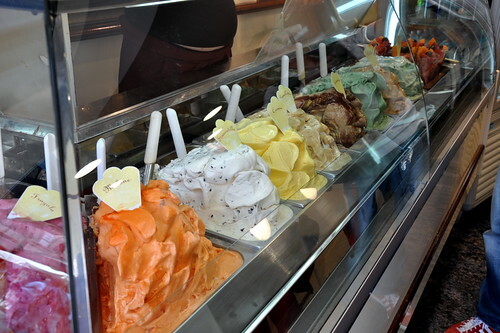 If a gelato is light in color, I know that natural 100% quality fruits and ingredients are used. And that's the difference between Italian ice cream and other wannabes--the use of real quality ingredients. Yi told me that the gelati in Australia, although good, don't have such pure flavors and just don't taste the same as Italy's. Yi had the peach and hazelnut (excellent) while I had the lemon granita (not good, too sweet, I had to water it down). 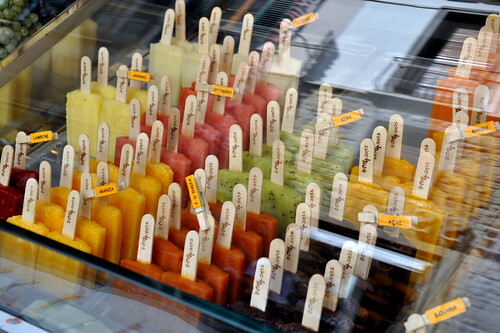 These ice lollies were made of 100% fruit, no water added, and were costly so we walked away. We regretted it. Vivoli's, near the church of Santa Croce (walk down Torta a block, turn right on Via Isola delle Stinche) is said by many to be Florence's best gelateria (I agree) but Rick warned that they are expensive and stingy (agree again). A small cup is 3 euros, I think. The shop also sells other desserts like tarts and cakes. You can tell straightaway that Vivoli's gelati flavors are 100% natural because the color are muted. Super fresh high quality gelati. Can't remember our selection but pistachio was always one of them. 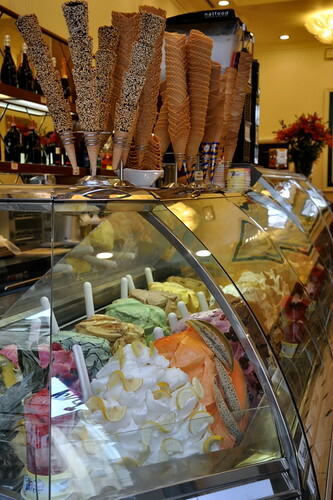 If you aren't fussy about your gelati, anyone of the gelateria on any street in Florence is good. You can tell by the colors in the next 2 photos that these gelati are colored and the flavors aren't as pure but still, they were good. 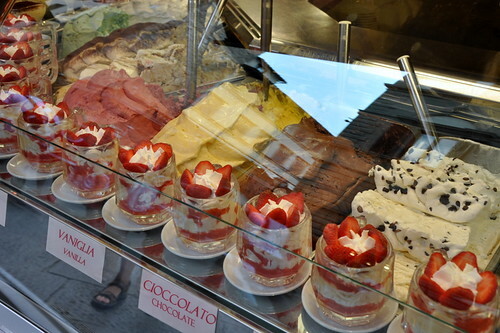 I'd rather pay 1 euro more for the good stuff because afterall, how many gelati can you eat in 4 days? This was another delicious cone from the gelateria on the Piazza della Signoria. I think it was zuppa inglese and mango. On a hot day, gelati's the best. That, and ice kacang. Terri, How did you like Vivoli's gelati? june: i did say in the post tt i love vivoli's icecream (very natural flavors) but agree with rick steves tt it's expensive n portion is small. oh.. must have skipped tht line. we went there upon reading rick steve's and thought it while the flavor were great, the texture were icy.. I wonder if it was coz we were there later in the day? It was definitely expensive for the cup. It was quite a disappointment for us.